VASCO: Sporting Clube de Goa knocked out defending champions Dempo Sports Club 8-7 via sudden death to move into the final of the AWES Cup, organised by the Association for the Wellbeing of Elder Sportspersons in collaboration with the Sports Authority of Goa (SAG) at Tilak Maidan, here, on Tuesday. There was hardly anything to separate the two teams in an end-to-end contest where both teams created and missed chances. After a barren first session, Dempo SC took the lead in the 54th minute when they launched a counter attack and Abranches crossed on the left for Jessel who finished with an angular left footer. Goalkeeper Melroy Fernandes thought he had the angle covered but the ball bounced awkwardly and sailed into the goal. Sporting Clube were stunned by the setback but managed to equalise three minutes later. It was a wonderful strike from Brandon who scored with a long range shot from almost 40 yards out. Brandon got the opportunity after the Dempo SC defence had cleared a corner kick from Cajetan Fernandes. Both teams then missed chances with Assumption’s long ranger hitting the crossbar and sailing out of play. Dempo SC also missed with Abranches hitting straight into the hands of the goalkeeper. The teams were tied 1-1 at the end of regulation time. 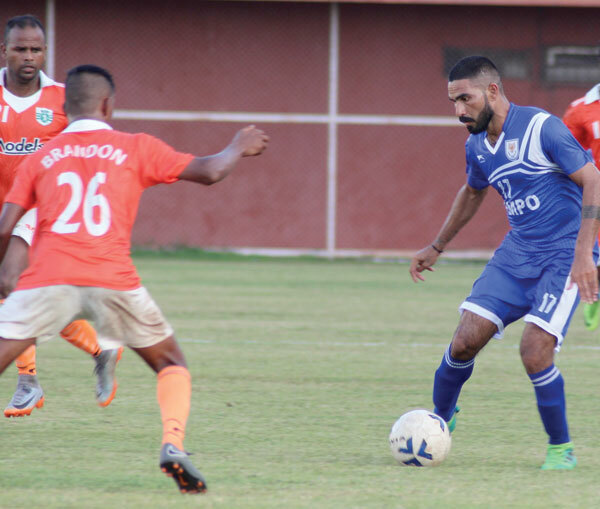 Dempo SC took the lead in the 54th minute through Jessel Carneiro while Sporting Clube equalised in the 57th minute through a brilliant goal from Brandon Gomes. In the tie-breaker, Sporting Clube missed the first penalty taken by Alesh Sawant but converted the next seven through Cajetan Fernandes, Marcus Mascarenhas, Ganesh Thakur, Clive Miranda, Brandon Gomes, Assumption Soares and captain Victorino Fernandes. Dempo SC were in an advantageous position, first taking the lead in normal time and then the tie-breaker when Velito D’Cruz and Suraj Hadkonkar converted the first two penalties. Naveen Mendes missed the third penalty. Jessel Carneiro, Chatur Naik, Joaquim Abranches, Olan Chandran all converted, Mario Mascarenhas missed the eighth penalty for Dempo SC. Sporting Clube will now meet the winners of the second semi-final between ONGC (Mumbai) and Salgaocar FC in the final showdown on Saturday, September 15, at 6.30 p.m.